I originally thought of this album as a collection of the songs I play on my solo gigs, melodies that I love and that reflect different eras of my life. However, my friends Hod O’Brien and Stephanie Nakasian generously made themselves available to record with me (they’ve recently completed two albums of their own, and travel quite a bit fulfilling their busy concert schedule). I can’t say enough about the inspirational qualities they both possess—Hod never runs out of fingers or ideas, and Steph is smooth, fiery, and crisp—it’s just a gas to play with them! Look for their album Comin’ Alive on VSOP. Bill Goodwin is the indispensable glue to this recording—he just does everything and made it easy to walk in and blow. (He also is heard on Savoy and Devil May Care playing brushes on a tape box marked “PowerSlave.”) Thanks Bill, you too, Kent. As for the songs, I hope you enjoy the selection. Stardust remains a favorite with me. During the early 70’s my brother and I audited a jazz class taught by saxophonist John Handy. He said “You’ll never play any different than you are now, it might be smoother, but you can’t change who you are.” So here I am on this cut, still playing the Blues. Done in one take, it is the best I have to offer. I loved playing tag with Hod on To Be With You, switching between soloing and the walking bass role. The song is a B-flat minor blues front-end resolving to D-flat major and finally to B-flat major at the end. Over the last year I’ve been playing Georgia as a waltz (thanks LeRoi) and find that it always takes me to some interesting places. Devil May Care was preformed by Miles Davis in 1962 and is written by my friend Bob Dorough, a genuine “cat” if there ever was one. We all just had a good time with it and I especially enjoy Bill’s imitation of Fred Astaire and his interplay during my solo. I’ve Got the World on a String with Steph was recorded last and she just wrapped up everything (doubling on “trombone”) with the style that only she possesses. The guitar I used on this recording is a Takamine steel-string with a classical neck. Tough to finger, but I love the sound. For those that need to know, the string set is 14, 20, 28, 40, 52, 65, and I don’t use a pick. Please excuse the glitches here and there, and the occasional “Sal grunt,” just think of them as spice in the soup. And finally, the cover photo was taken at the Deer Head Inn in Delaware Water Gap, PA.
Blue Indigo is one of those things in life that you swear is just destiny taking hold. 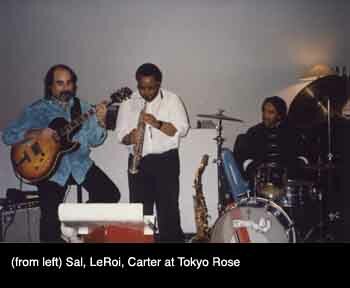 The band began when George and “Miss Lucy” (as he calls his weathered Hammond B3) stopped by to sit in with the Sunday night trio at Tokyo Rose which consisted of Carter Beauford, LeRoi Moore, and myself usually playing a mix of R&B and Jazz standards. From the first moment when George’s feet articulated those driving bass lines, it was like holding onto the tailpipe of a Chevy and being dragged around the parking lot. Lightning struck, sparks flew, and what can only be described as nuclear fission took hold. Night after night magic happened. Many were the times Carter and I would play the exact four measure impromptu phrase and turn to each other and laugh. 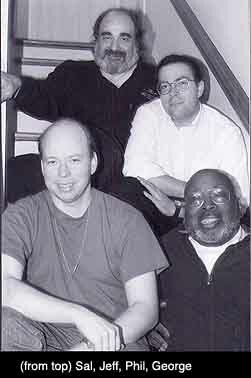 George could seemingly become two people, playing in opposing meters and structures, yet always returning to crescendo behind LeRoi’s exotic explorations and driving leads. Those were glorious nights. Yet as life would have it, Carter and LeRoi left the band after a year to form a group with Dave Matthews to go on to well deserved fame and fortune, leaving the spark that was started innocently, still glowing. 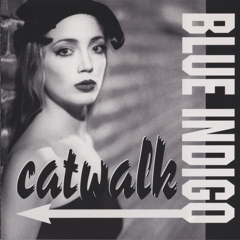 Later, Blue Indigo began to take shape again, and after various testings and incarnations another union was formed—with the brashness and commitment that list at the heart of Blue Indigo, but also possessing a decided cleverness and élan, lead by the undauntable spirit of Jeff Decker and the solid support and creativity of Phil Riddle. Again the spark glowed hot and burst into flame. Jeff is an incredible sprinter, able to articulate quickly the mood and presence of a song. Yet, he can run the long race with pacing and endurance—he is the Mr. Jones. Working with the strengths and talents of the rest of the team, Phil is the rock and quiet focused thought that pushes the band higher and higher. 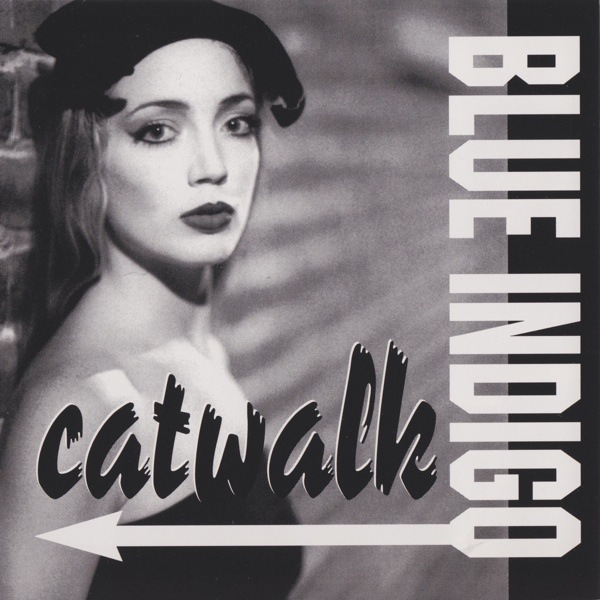 Blue Indigo does not compromise—it is a wonderful combination of drive and daring where the next moment can’t be anticipated but is never in doubt. It has been my distinct honor and pleasure to be a part of this group and I am grateful to them always. The material recorded here is all original yet somewhat familiar. It is based on my love and understanding of the Standard song, mixed with the inevitable musings and experiences of my past. My profound gratitude to the group for adopting these into our repertoire. I’d like to share a thought about each. 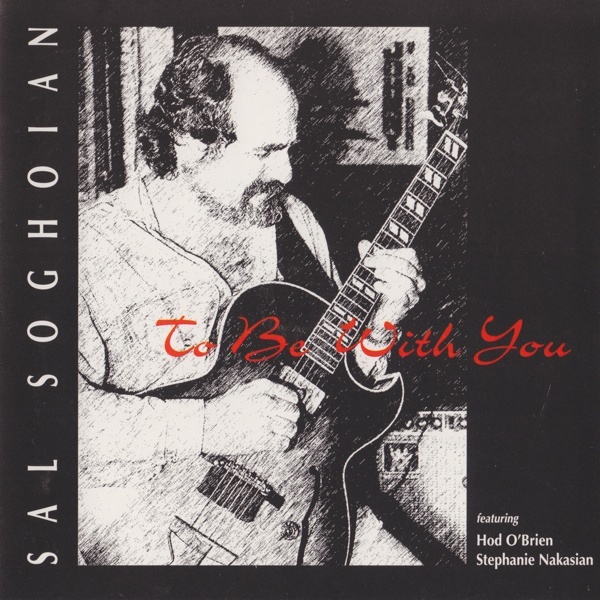 1) Wessin’ It • Even though the title refers to Wes Montgomery, this is my tribute to Joe Pass. Many years ago, I got the sound of Joe playing Cavalerie (on the For Django album) in my ear and it has haunted me since. I moved it to A-flat and did a little Wessin’ for the head. 2) Blues for Lois • I was working at a roadhouse bar in the Pocono’s when I heard Lois Brownsy sing. I immediately went upstairs to my room and penned this edge-city Blues for her enthralling persona. It took five years to earn the inspiration for the bridge, but the sone is actually about two women—neither of them Lois. 3) When Will You Ever Love Me? • This ballad in G-flat plays on the fact that the chromatic harmonies in the song are chords our ears usually hear in other venues. I particularly like the duet with Jeff at the beginning. 4) George’s Blues • “West Coast” Melvin meets Count Basie! George stretches out on a shuffle which cycles around to get back home in an interesting way. The band joins in for a shout chorus exchange with Phil and after the last rendition of the easy-going melody, kicks into a Bill Doggette groove with Jeff taking control. The ending chord is classic Melvin. 5) Catwalk • I have this theory about men… that we’re always filming videos in our mind with starring as the tragic hero—a cross between Cary Grant and Mike Hammer. We keep filming this saga until we realize one day that no one is watching and we don’t get graded on it in the end. At that moment—we grow up. This is a tribute to the part of us that keeps filming. The song has all the key elements: the gossamer bewitching girl (played wonderfully on our cover by the fetching Emily Tisdale), the hero (us), and the bad guy (hiss). After an introduction to the characters and a romantic nighttime interlude in the Gotham-esque city, we’re off on a chase and fight to justice and vindication. Naturally, we get the girl n the end, but wake suddenly to find it was only a dream… or was it? 6) Goodbye Lady Rain • George’s lady, Alfreda, can spot the girl-that-got-away side of me in a second. There’s an unsung lyric in the second part of the bridge that goes: “You’re the dream-witch of starlight, so tonight, please pass me by.” You get the idea. 7) That’s Why They Call Him Mr. Jones • I vividly remember seeing Jeff take chorus after chorus on Have You Met Miss Jones at Miller’s one Thursday night. I was amazed how each time through the form he just kept blowing hotter and hotter. This tune is his tour-de-force. In a long-paced structure with lots of room to run, he builds his solo through stop-time sections to the inevitable well-placed crescendo. Just when you thought that was it, he’s followed by special guest Hod O’Brien playing those un-breathable phrases that are his trademark. Master musicians they both are. 8) Oreo Con Brio • I wrote this one for Tony Heath. I really liked the sound of Tony’s soprano sax and found it intriguing that such a smooth tone came out of Tony’s contortions—he really works for each note. Latin-based, I guess, it’s just a neat use and Jeff tears it up, passing the baton to Phil who solos effortlessly over the repeating background phrase. 9) The Hang (Backyard Tent Meeting) • It’s the classic backyard tent meeting with the swaying choir, the preacher, and of course, the Devil making his attempts to snare the unbelieving. Lots of finger-pointing and hand clapping here. George starts his solo with a churchy “slow walk” and then skips into a romp, hanging off to Jeff who is backed by the choir. I make the occasional appearance and the frustrated conniver, but am quickly rebuffed. Was the end ever in doubt? Thanks to the “ladies” of the Indigo tambourine chorus for their invaluable assistance. The success of any project is dependent upon the tireless efforts of those “behind the scenes,’ or in this case, those at the mixing board. 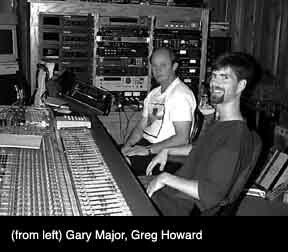 Gary Major of Major Studios graciously shared more than technical expertise—he became a creative voice in the mix, adding key insights at just the right time. We than him and Major Studios for their work. Not enough can be said in this short space to thank Greg Howard carrying a tired producer and group through the mixing and mastering process. Greg’s talents are staggering and cover the gamut. We are extremely fortunate to have him work us into a schedule that can only be called “demanding.” Thank you brother.